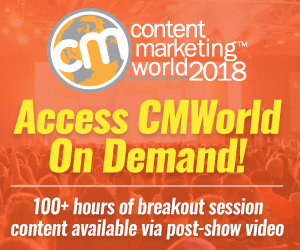 Want your content marketing to stay top of mind for your prospects and customers? Then use photographs to tell your story but understand that the images you choose are important elements that contribute to making your message memorable. To make your photos memorable, you need a story and context. Here are three simple tips based on scholarly research entitled, “Understanding the Intrinsic Memorability of Images” by Phillip Isola, Devi Parikh, Antonio Torralba and Aude Oliva. Show people. Images of people are the most memorable. People are hard wired to focus on other people. Use human-scale space. Provide context for your visual story about your product. Related to this point, utilize product close-ups. Skip landscapes. No matter how amazing a vista may be, your viewers will find it totally unmemorable. The one exception to this rule that the researchers found was when the image featured something unexpected. In other words, your image needs a story to make the scene memorable. Here are seven ways to enhance your visual content marketing using these three tips. Note that many of the photographs are used on social media. 1. Spotlight your brand. Show your products in action. 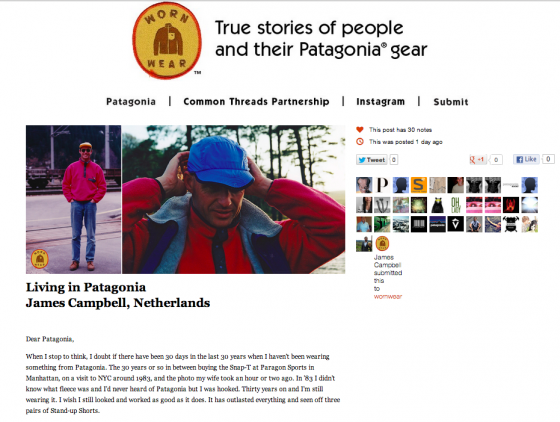 Create hero shots focused on your products. To make them memorable, put them in relationship to people. Actionable Marketing Tip: Highlight the product both with and without your brand. 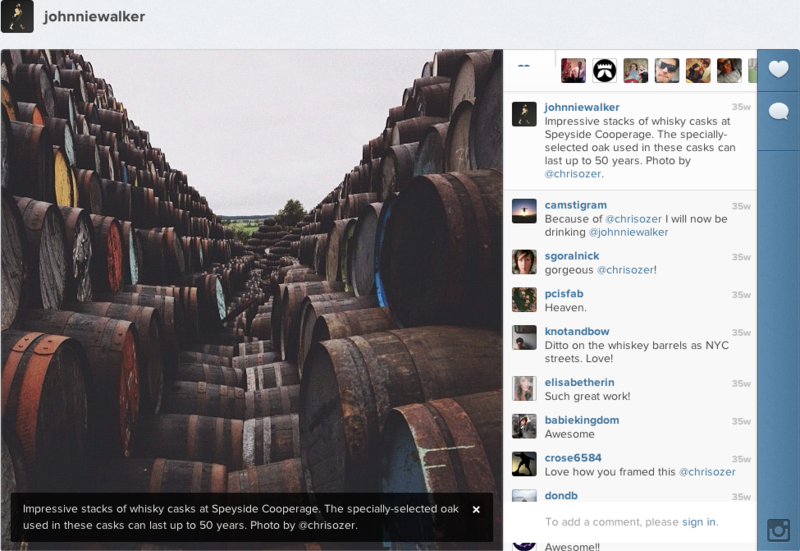 Here are two Instagram images highlighting Johnnie Walker. Both put the brand in context, a drink and whiskey barrels with landscape in the back. The rich quality of these images underscores the high quality of the Johnnie Walker product. 3. Tell your story. Stories make your information more memorable because they provide context for the facts that you’re relating to your audience. Since childhood, we’ve been trained to look for pictures when we hear stories because they help us understand and remember. Actionable Marketing Tip: Use your customers’ stories as well as your own. Patagonia’s customers are such fans that they submitted images and text that are incorporated into a Tumblr. 4. Style your products. Customers have trouble visualizing how your product will fit into their lives. This isn’t just limited to clothes. Think high-ticket purchases such as weddings, appliances and furniture as well as high risk purchases such as haircuts. Actionable Marketing Tip: Put your products in the context of the other items your prospects will be using. Here’s a Pinterest page from Kitchen Cabinet Kings where they offer their prospects the chance to see how other people have designed their kitchens, a high ticket investment. 5. Show your customers how to use your offering. People tend to be visual. 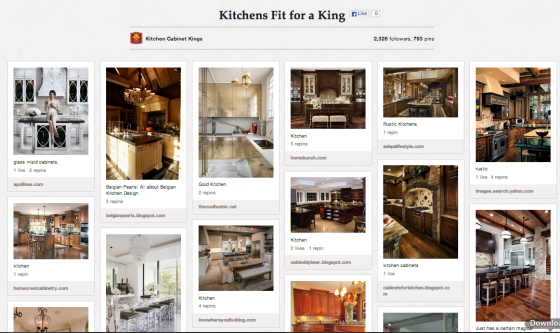 So provide how to information including recipes and patterns with images. 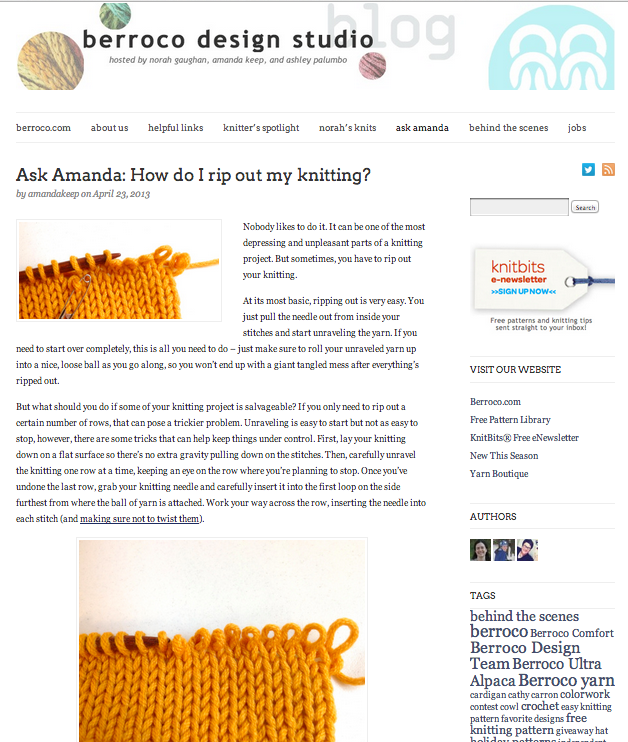 Bear in mind that foodies and crafters are very active on social media and may use targeted platforms like Ravelry. Actionable Marketing Tip: Encourage your readers to share your images on other social media platforms such as Facebook and Pinterest. 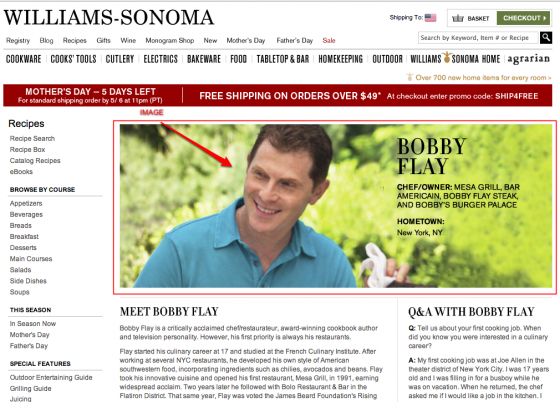 Cookware retailer Willian-Sonoma leveraged their relationship with Chef Bobby Flay to provide content. What draws the reader in? You guested it. A photograph of the chef. 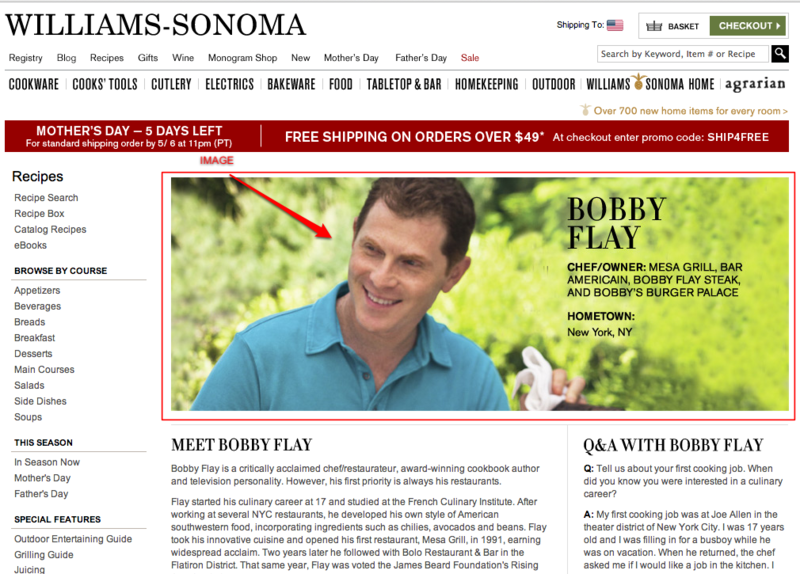 Below is a Bobby Flay recipe posted on William-Sonoma’s site. It also contains images of the finished dish as well as the related products you need to make it. It’s subtle upsell. 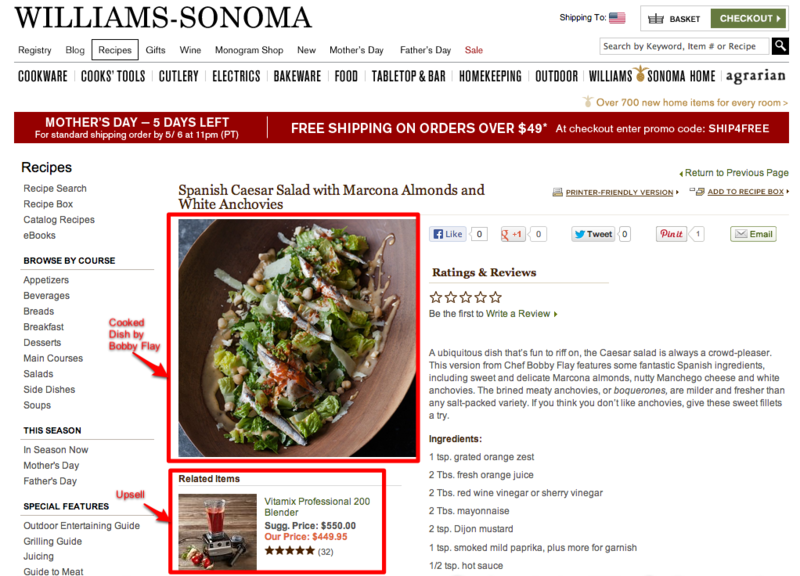 Willliam-Sonoma has integrated their blog into their website. 6. Entertain your fans. 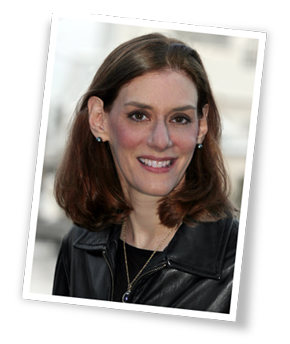 Use amusing photographs to lure your prospects, customers and the public in. This type of image is great for building your brand. Also, they can be highly viral leading to additional social sharing and earned media reach. Actionable Marketing Tip: Understand what your audience finds humorous. Usually small children and pets work. Friskies publishes a combination of content on their Facebook page but the cat photos tend to get more likes and comments. 7. Celebrate your customers. Get your customers into the picture. Understand that it’s often your raving fans who seek to associate with your organization on social media. Reciprocate by putting them in the spotlight. Remember it doesn’t have to be your customers directly; it can be their handiwork. Actionable Marketing Tip: Ask your fans to share their photographs. Take a page from Oreo’s playbook. 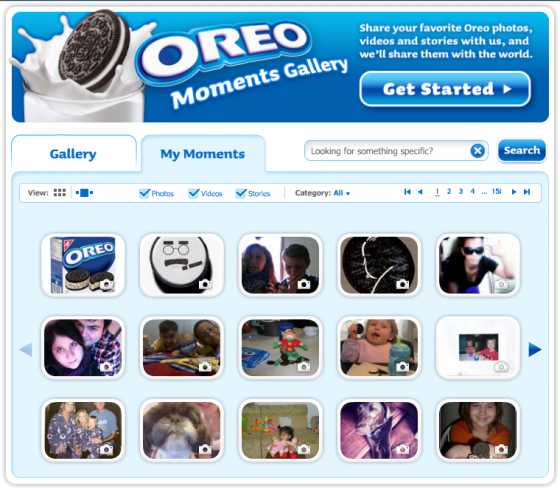 They have an Oreos Moments Gallery on Facebook. 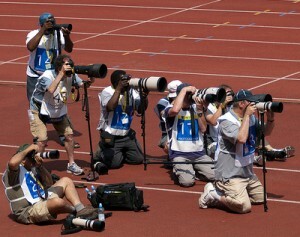 Photographs provide great content to fill your marketing pipeline. 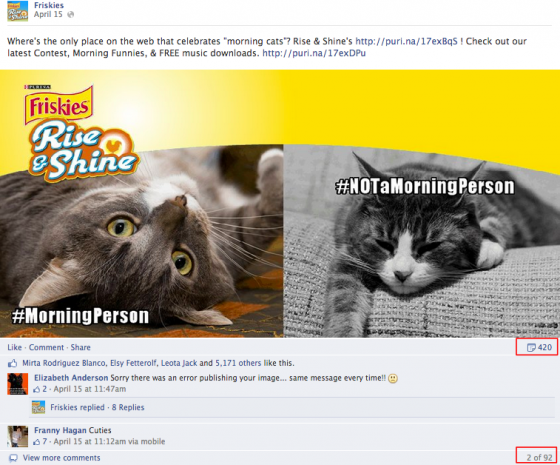 Leverage the power of these images to highlight your brand and how to use your products as well as to engage fans. Before you post your photos make sure that they’re as memorable as they can be. Have you found the use of photographs to be effective at engaging your fans, customers and prospects? If not, what challenges have you had? Tags Antonio Torralba, Aude Oliva, Devi Parikh, image, Phillip Isola, Photo, Pinterest. Bookmark the permalink. These are all great tips, Heidi. Thanks for sharing them with us. I think that they can be greatly applied to Instagram and Pinterest marketing strategies. If done correctly, these tips can really enliven both your Instagram feed and your Pinterest boards. Thanks again. Interesting you should say “underscores the high quality of the product”. 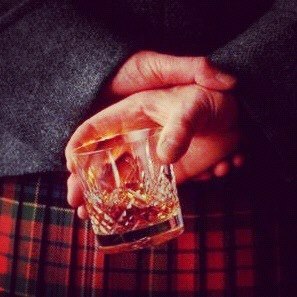 The best whiskies are either single malts or a blend of single malts. But low-cost producers found a way to simply use what in the industry is called “silent spirit” – simple alcohol fermentation from any fermentable product. This is obviously much cheaper than making it from the right grains in the right place with the full whisky production method. Johnnie Walker is an attempt to position a blended whisky as equivalent to a single malt product. It seems that, with you at least, they’ve succeeded. One rule I’ve always found in marketing – those with the worst product spend the most on marketing. Basically, they need to. Peter– Thank you for your input on whiskies. It’s not a topic that I’m an expert on. Given their product as you describe it, they’ve done a good job in positioning it.